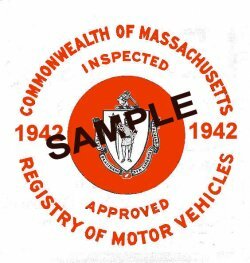 1942 Massachusetts SPRING Inspection Sticker (RED) - $20.00 : Bob Hoyts Classic Inspection Stickers, Add a Final Touch to your Restoration! Here is a beautifully restored and reproduced 1942 Massachuseets SPRING Inspection sticker. The word "SAMPLE" is NOT on the sticker.